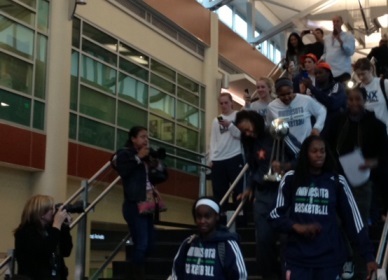 The Lynx returned home as WNBA champions shortly after 5:30 Friday, and roughly 200 fans were there to greet them at Terminal 2 at the Minneapolis Airport. The fans stretched so deep that they were blocking off the route to baggage claim. They waited patiently at the bottom of a staircase -- sometimes spontaneously breakout out in "Let's Go Lynx" chants and then burst into loud cheers when players walked down. Players held up cell phones to record the scene, just as fans did. Fans also chanted for head coach Cheryl Reeve and she blew a kiss. "When you know it's over and you won, it's amazing," guard Lindsay Whalen said. We'll have a full report plus video later. RandBall: Did Ponder get a long enough look from the Vikings?